The heel is 3” high. These are in excellent pre-owned condition. Footsavers by Drew. US Size: 8AA. 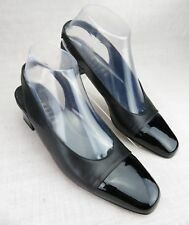 Pretty Leather Slip On Casual Dress Pump. The pictures shown above are the exact pair you will be receiving. Length (Heel to Toe Outer soles): 10". Upper Construction: Patent Leather. Heel Height: 4". Sole/Heel Construction: Man Made. Insole Construction: Man Made. Color: Beige/Black. We Strive To Bring Great Value Every Week! Heel Height 2.75". This item was cleaned with a professional cleaning agent to ensure the best quality. 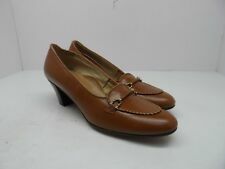 MUNRO AMERICAN Brown Leather Pumps Heels Shoes w/ Buckle - 8 SS Slim. Condition is Pre-owned. In very good condition with some scuffs on toe of shoe. Thanks, S.
Labeled a size 8AA (extra narrow). Fabric content is all Leather construction. Have all leather uppers and soles with a 2.25" x. 88" heel. Clarks Woman's Bendables. Soft leather upper. Black leather. Man made material. Length - 10”. Excellent Condition! Appear to have only been worn once or twice. Very Nice! These are a darker brown shoe. There are very little marks on these shoes and are NICE! "STUART WEITZMAN" BLUE SUEDE PERFORATED SQUARE TOE CLASSIC HEELS IN SIZE 8 N /narrow/, MADE IN SPAIN! EXCELLENT PRE-OWNED CONDITION! LENGTH - 10 14/16" OR 27.5 CM. Very nice shoes with a lot of wear left. Gorgeous party shoes. 100% leather. gold sequins topped with beads accent toe and heel. ETIENNE AIGNER BEAUTIFUL DESIGNER SNAKE PRINT PUMP. We will do our best to make things right! Spectacular Lanvin studded suede wedges. France's oldest design house, Lanvin is the benchmark for Parisian sophistication Army-green, mustard yellow and tan suede Buckle-fastening ankle strap. Runs small. 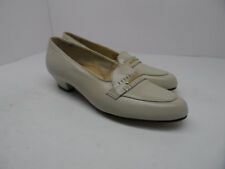 Vintage Salvatore Ferragamo women's shoes Dark Brown Leather low heel classic slip on pump size 8 2A Extra Narrow Made in Italy Excellent pre owned condition next to no signs of wear. This is a pre-owned item. Please see all pictures when viewing an item and note the imperfection(s) by zooming in on the item. High-quality shoes are created from the finest materials and are produced in the famous Veneto region of Italy. Overall condition is nearly excellent, showing minimal wear. Gorgeous white sandals, worn once, too tight for me unfortunately, otherwise I would rock them. They run small. 38.5 European size. HEEL HIGH: 5". COLOR: BEIGE. PRE-OWNED IN VERY GOOD CONDITION.